Now while I'm on the fence whether I should be sorry for purchasing the Motorola Milestone ahead of time, only to find out that the Google Nexus One will be released a few short days later, my hands-on time with the Google Phone has put me at ease--I shouldn't be too sorry after all. Find out why on my review. As you can probably tell, the Google Nexus One is thinner than the Motorola Droid / Milestone and is definitely much lighter to hold. The Google Nexus One is also marginally wider than the Milestone and both phones are almost at the same height. Although both mobile phones sport 3.7 inch screens, the Google Phone is supposed to have an AMOLED screen. Hmm, maybe it's just Motorola's backlight but the former's screen seem washed out so the Milestone screen's comes out more vivid when both mobile phones are compared side by side. 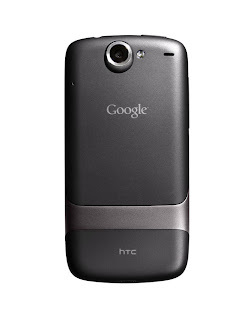 The Google Nexus One is made of some soft velvety material, it's what most bloggers refer to as a soft back finish. Because of this, the Google Nexus One feels luxurious to hold. The Motorola Droid or Milestone here in the UK did an amazing feat of being the thinnest mobile phone with a slide out QWERTY keyboard but Motorola didn't do much with the Milestone's design thus the Google Nexus One comes out as the sexier mobile phone between the two. 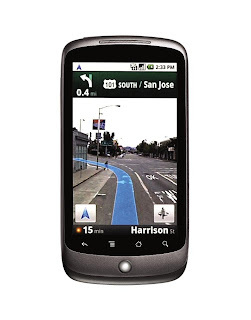 Feature-wise, aside from the faster processor, bigger RAM, and Android 2.1, almost all other features of the Google Phone and the Motorola Milestone are the same: 3G/HSDPA, WiFi (but the Nexus One supports 802.11 n), Bluetooth, and GPS. So what's new on Android 2.1? Well first, there are now 5 homescreens with the ability to get a preview of your homescreens in a card-like interface. Gone also is the arrow button which you can flick up and down to open and close the main menu screen. Instead, there's just one icon to press in the homescreen and your main menu will kind of have an animated transition effect which would replace your homescreen, similar to that onthe Nokia N900. The UI of the Google Nexus One features more animated content (maybe because they don't know what to do with that much processing power so they're wasting it on animated screens). Speaking of animations, the media gallery is another place where Google peppered with animated UI. I'm not saying it's bad, it's actually REALLY pretty and good for boasting but I'm not saying that it's actually useable. Another new thing on the Google Phone is the live wallpapers (again, it means the wallpapers are animated). This is nothing new for those who have Sony Ericsson mobile phones and have been loving their live, flash-based homescreens but of course, because the Google Nexus one has a 1GHz processor, the live wallpapers on this mobile phone is more amazing. 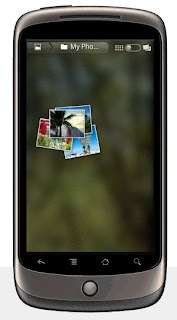 As for the 5 megapixel camera, that's another thing that the Google Phone has over the Motorola Droid. The Nexus One simply snaps pictures faster, period. I was actually disappointed with the Milestone's camera especially at night or even in daylight but the Google Phone definitely improved on this department. As for audio quality, when using earphones, both the Motorola Droid and the Google Nexus One is head to head (but then again, maybe my JBL headphones are just good) but when it comes to speaker, the Motorola Milestone comes out on top as Google's phone seems more tinny than usual. Speaking of audio, Google didin't feel the need to change the music player on Android 2.1 which is really disappointing. They could have made use of their animations on this department as I would have loved to see a much better implementation of the iPhone's CoverFlow interface. As for the browser, there's not much difference again in this department except that the Google's phone doesn't support Multitouch. Of course, those itching for multitouch on the Nexus One can download the Dolphin browser in the Android market (for free) to experience multitouch on their mobile phones. 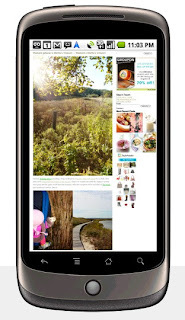 Because of the 1GHz Snapdragon processor, the Nexus One is able to load web pages a bit more faster than the Motorola Milestone. Like I said, I didn't feel that much disappointed after having a play with the Google Nexus One. Sure, it's a pretty phone and the new UI is snappier and much more of an eye candy compared with the Milestone but Droid/Milestone owners don't have to break the bank to upgrade their mobile phones that soon. As for those on the fence whether to get this, the Droid, or the iPhone 3GS, well, the Google Nexus One has come head to head with the iPhone 3GS and the UI of the Nexus One is up to speed with the iPhone and, although iPhone fans might hate me, I must say that because of the animations, the Nexus One's UI has a slightly more edge over the iPhone. As for Android lovers, you might want to get the Milestone for the physical keyboard but if that doesn't matter that much to you, then the Google Nexus One is the better choice. Early adopters might want to visit Vodafone from time to time because word has it that they'll be offering the Google Nexus One in a few weeks. I want one. 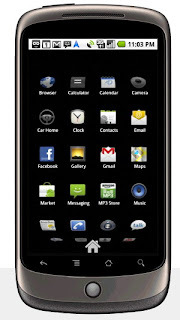 Which UK Carrier will get the Google Nexus One? :) Like I said, word has it Vodafone will get this mobile phone in a few short weeks. 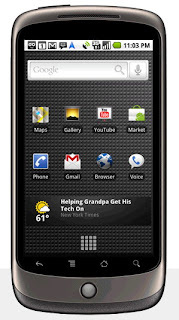 Is the Google Nexus One already available in the UK? @Iness: It's available WITHOUT a contract on Google's website. Go to www.Google.com/phone to order yours. I have to warn you, the unlocked price is a bit steep. Awesome!! iPhone will surely release a much better phone this summer. Thank you for the competition! BTW, does the browser support flash? I can't say. Wasn't able to test that much websites on it but it seems that like the Droid, the the browser would support flash in the near future. So is it true that the European version has multitouch? This one is actually a US version so there wasn't any multitouch there. You can however download the Dolphine browser if you want to get into the multitouch action. m-eh, I'll pass. Will still get the iPhone on Voda. Man, I'm glad I didn't get the Milestone or the iPhone yet because now I want the Nexus One more. I hope O2 gets this. HTC Hero is still the best Android phone in the market. Now if someone ported the sense UI on this one, I might change my mind. I'm so tempted to get this on Google but the price for an unlocked phone is just too much. BTW, what's with the activate phone? DO unlocked phones need to be activated? @Anonymous. No, you don't need to activate an unlocked phone. Activation is just for people who bought the phone under a T-Mobile Contract. Damn. I ordered this through Google USA and now that the Desire is coming to the UK, I'm bloody regretting my decision. Great article, I love this phone, my friend has it. Multitouch feature is just something that really make this desirable.